Lay the foundation you need to set yourself up as an expert in marketing. Choose your focus and advance in skill with guidance from our experienced, available faculty. You'll gain the competitive edge by mastering how to bring a product or service from the idea stage to marketplace acceptance. Get real-world experience with Nashville-area businesses and social enterprises. You'll graduate with the clout you need to flourish in corporate marketing, advertising, public relations and more. We have designed our curriculum with the goal of developing business leaders who embrace the values and virtues of Jesus. Developing the values of being purposeful, bold, credible, creative and servant-hearted make our marketing graduates hirable, productive citizens. 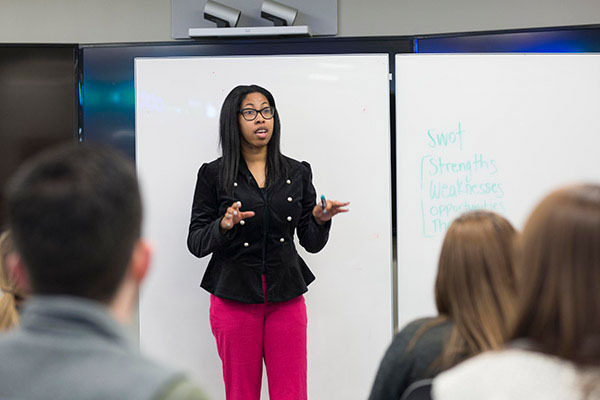 A foundation of sixteen required business core courses provides our marketing majors with a firm grasp on key marketing principles and affords them the competencies to become ethical leaders. The Policy and Strategy course will be your capstone project. Marketing (MK), Information Technology (IT except 1000 and IT 2043), Art (AR), Communications (CO, except CO 1003), or EN3123 ST: Social Media. Students should consult a departmental advisor in course selection. Marketing (MK), Information Technology (IT except 1000 and IT 2043), Art (AR), Communication (CO except CO 1003), or EN 3123 ST: Social Media.